At the Samsung Developer Conference, it was clearly mentioned that the South Korean Giant is working on its infinity display technology and ever since Galaxy A8s has been in the news. The upcoming device is scheduled to be launched in the month of December and was expected to be the first device to come with an infinity-O display but Huawei is also in line to bring its smartphone with infinity – O display and it will be interesting to see who will bring the so said technology to the market first. 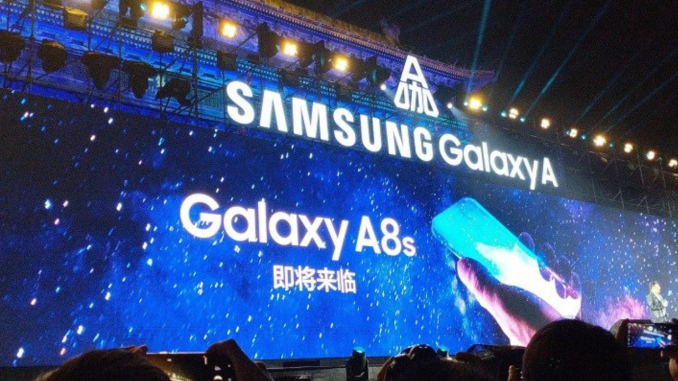 The Galaxy A8s is said to be featuring a 6.39-inch Infinity-O touchscreen display with FHD+ resolutions although the aspect ratio is not mentioned. The LCD display panel is expected to be manufactured by BOE but we need to wait for the confirmation. The handset will be coming with a USB Type-C port and will have a 3400mAh battery on the rear to power the smartphone. Moreover, the Galaxy A8s is said to be coming with a Snapdragon 710 chipset coupled with 6GB of RAM and 128BG of storage as of now. It could also get other storage variant and it will be interesting to know it. On the camera front, the device will be coming with a triple rear camera setup with resolutions of 24MP, 5MP, and 10MP but nothing is confirmed yet. There will be a 24MP selfie camera and the device will be measuring 159.11 mm x 74.88 mm x 7.38 mm. Well, we need to wait a few more days before the official specs are revealed.